A report from the Royal Bank of Canada says Ripple and XRP can save banks and financial institutions a significant amount of time and money. According to the report, blockchain at large can address pain points in the remittance industry by removing middlemen, reducing cost and increasing transparency. When it comes to Ripple and XRP specifically, the Royal Bank of Canada points to both Ripple’s suite of software products and the XRP ledger as examples of how blockchain can disrupt the industry. “Ripple created an open source, peer-to-peer, decentralized protocol, with a network of participating financial institutions (RippleNet) and a series of individual technology solutions including payment processing (xCurrent), liquidity support (xRapid) and payment access (xVia). 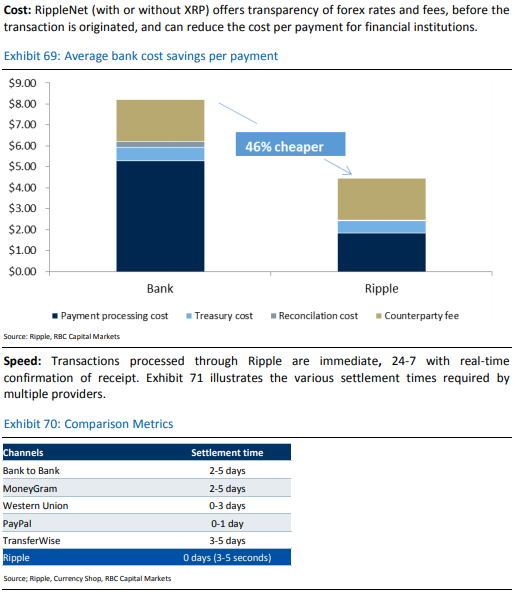 The June report also states that Ripple, with or without XRP, can save banks an average of 46% per payment. The Royal Bank of Canada is the largest bank in Canada by market cap, with more than 16 million clients. The post Royal Bank of Canada Says Ripple and XRP Can Save Financial Institutions 46% Per Payment appeared first on The Daily Hodl. Next: Next post: Is a Multi-Layered Consensus System Able to Provide Network Resilience to 51 Percent Attacks up to 90 Percent?